This project is one that can be adapted to a variety of projects and surfaces. 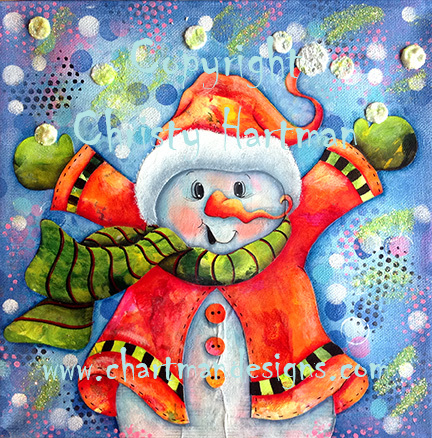 I gell printed the Snowman’s hat, coat, scarf, and mittens using my Gelli Arts Plate but you could easily use paint instead. Gel printing is simply a type of mono-printing and can be accomplished on a variety of surfaces, craft mat, mono-printing plate, plexiglas plate or any non-porous surface. I have included a variety of photos to help you on your gell printing journey. You are purchasing the e-pattern for this product and will receive a link to download the pattern once payment has been verified.